Naughty Radish restaurant manager Darachan Yakorn spent 20 years in London. Naughty Radish restaurant manager Darachan “Nok” Yakorn spent 20 years living in London before returning to Thailand to raise her children in their native culture. Her family are now scattered around Thailand – her children live with their grandmother in Bangkok, while Nok’s husband Virat (who she met in London) works in Khao Yai. 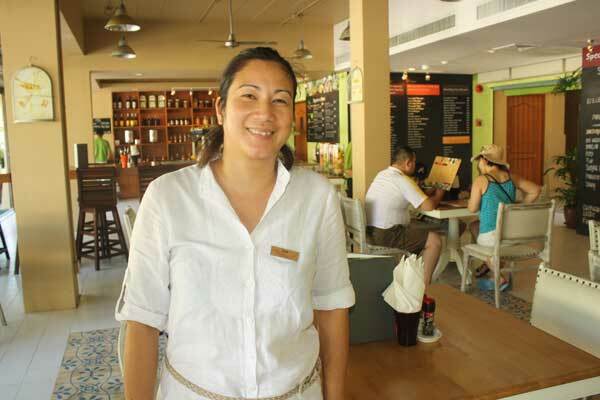 Because of this, she devotes her time to the vegetarian-friendly salad restaurant, located at the Burasari resort in Patong. The breezy restaurant, adjacent to the resort’s Just for You juice bar, has air-con, but its doors are glass, meaning it has the feel of sitting outside but without the suffocating heat. Massaman sauce is tossed through a fresh salad. There is also a create-your-own salad bar, grilled meat dishes, and a host of vegetarian options. Salads are priced from B220 upwards. As a vegetarian herself, Burasari group owner Lily Udomkhunnatum wanted to start up a restaurant with healthy food, as well as provide great vegetarian options for similarly-minded customers. Priced around B120, drinks from Just for You include the trademark Detox Special – perfect for those recovering from a night out on Bangla Road – made from mango, pineapple, kiwi and mint leaves. Also popular is the Carrot and Ginger Energiser, made from carrot, tomato, lime, parsley and root ginger. In a nutshell, Naughty Radish is the perfect place to have a light lunch before heading to the beach, or a great way to relax once you’ve had your dose of sunshine. Not that naughty, but nice.